Decleor Relax Intense Bodycare Range includes four new products. Fruit Seed Scrub formula is without any oily residue and perfect for a spa moment every week. Relaxing Shower Oil becomes a silky foam under the shower to gently clean the skin. It's oily texture limits sensation of dryness on the skin and leaves the skin smoothed and comfortable. Massage Balm is a 100% natural balm with melting and wraping texture that helps to relieve tension. 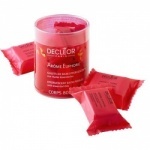 Decleor Aromessence Relax Intense with 100% natural oils cover the body with a deep feeling of peace. Decleor Arome Tonic Tonifying Body Fragrance is a fragrant body mist with Essential Oils and a Plant Extract. A simple spray moisturises, softens and energises your skin. Decleor Relax Intense Fruit Seeds Scrub is designed to leave your skin is left feeling soft, visibly more supple and silky. Decleor Arome Euphoric Pebbles release a bouquet of warm aromas on contact with water, bringing sensual, musky scents to your bath.